Pandemonium is the second book in Lauren Oliver’s Delirium trilogy. If you have not read Delirium, the first book, then this review will contain spoilers. You can find a review of Delirium here. After the life-changing events of Delirium, Lena Haloway finds herself alone and running headlong into a future that she cannot imagine and has little control over. Finally collapsing in the wilderness she is found and adopted by a rag tag band of Invalids – those uncured of the deadly disease that is Deliria Amor Nervosa. As she embarks on a life that epitomises struggle, Lena is also experiencing the pain that Deliria can cause as she mourns Alex and tries to face a future without him. Eventually she finds herself in New York working for the undercover Resistance, spying on a young man who represents everything she once was and everything she now hates. Lena is a different girl from the one encountered in Delirium. Her rather inward-looking naivety has disappeared, replaced with a toughness borne of loss and hardship. Rather than give in to her pain, Lena ploughs through each day in a daze of grief and physical frailty that soon morphs into an inner strength, not to mention a deep cynicism when she finally finds herself out of the Wilds and in New York. All in all she is a far more likable character than in Delirium and one that it is hard not to admire. As she learns to live with her grief she finds herself slowly moving on from Alex and begins to embrace the life and freedom that he wished her to experience. However, she is not so far removed from the past that she has forgotten what it is like to believe that Deliria truly is the “deadliest of all deadly things” and this allows her interaction with new character Julian to be both finely nuanced and completely fascinating. Julian himself is interesting in that it his motivations aren’t always entirely clear. Son of a leading figure in the fight against Deliria, he clearly believes the disease to be dangerous yet there seems to be more to him this - something that Lena picks up on straight away. He clearly has secrets and as they slowly emerge he is not only a hugely sympathetic character but a compelling one. He has an odd sort of integrity and the conversations between him and Lena are riveting. He’s not Alex, in fact he is as far removed from Alex as one could imagine but in many ways he a more multi-faceted character. Of the group that Lena finds herself a part of in the Wilds, leader Raven is by far the most mysterious. Not much older than Lena, but aged by the life she has led, her motivations are about as clear as Julian’s. On one hand she seems genuinely caring but on the other bears a prickly coldness that can, ironically, only have been created through having loved and lost. She’s pretty hard to fathom but that only makes her all the more readable. Her male counterpart, Tack, is even more fathomless – yet increasingly likable. Alex, of course, is not part of this group – he is gone, lost at the fence that Lena runs from at the end of Delirium. Yet, for a character that does not feature in person he is ever present, haunting both Lena’s dreams and her waking moments. The storyline of Pandemonium is clever. Told in alternate chapters, the narrative swings between “then” and “now”, allowing readers to learn both what Lena is doing and how she got there concurrently. This works surprisingly well. What works even better is the way that Lauren Oliver has effectively subverted the story of Delirium in its sequel. Lena has become Alex, Julian plays a version of the old Lena and Deliria looms all around. While Pandemonium is far from a retelling of Delirium it is fascinating to see how Lena has evolved and what this evolution brings to the new relationships in her life. Cleverly, Oliver also illustrates the pain and conflict that love can engender, using Julian’s often extreme views in clever contrast with the agony that Lena feels over Alex, leading readers to ponder who is better off. Oliver’s writing is, as usual, beautiful. She is able to use language in ways both gorgeously fluid and bluntly harsh and it is never less than effective. She is also a mistress in tension be it in action-filled sequences of evade and escape or quiet moments in dank, city sewers. 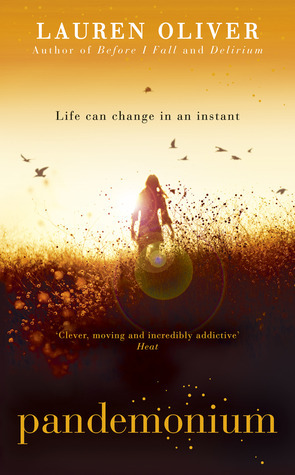 Delirium invited comparisons to Matched by Ally Condie, another extremely readable dystopian vision of life without love, but as the two trilogies continue apace, it is clear that Oliver has created something completely original in terms of vision, scope and heart-break. Indeed as Pandemonium reaches it’s oh-so-inevitable yet heart-rendingly awful climax readers will be left gasping for more and counting the days until next year’s Requiem – the final in the series. As with Delirium, Pandemonium is highly recommended.